May has been a hectic month for RKM. May has seen events piling high, coverage aplenty and lots of brilliant social media activity rolling out. All the while RKM have been keeping up media relationships, building new ones and expanding knowledge into new areas of the ever-changing digital sphere. The start of this month saw a fantastic day with HydraFacial, as their World Tour came to Dr Rita Rakus’ London Clinic in Knightsbridge. RKM oversaw appointments with over 30 members of the press. Bloggers including Peony Lim and Cassie Snelgar attended, as well as print titles such as Red Magazine, Fabulous, POWDER, The Express Online, Stylus, Wedding Ideas, Independent and Get the Gloss. All who came were baffled by the results of the HydraFacial and Perk Skincare treatments, and it made for a brilliant day. Lots of beautiful faces leaving the clinic to be showed off across London! 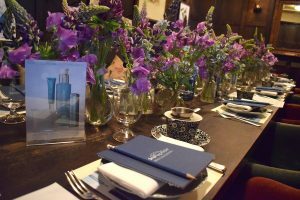 US brand Hydropeptide launched in the UK with 2 fantastic events, organised by the RKM team at Dean Street Town house and the Riding House Café in central London’s Soho. With attendees including consumer titles: Cosmopolitan, Woman&Home, GQ, Daily Mail and Simply You, and trade titles including Stylus, Mintel and TrendStop both events were a huge success. RKM was also enlisted to manage Hydropeptide’s social media channels through the event. Great coverage was gained platform-wide, showcasing the products, and journalists enjoying the expertise of Dr Neal Kitchen, Hydropeptide’s COO. Throughout May SCRUBD for men ran their shining new ‘Masters Series’ campaign on social media showcasing how men have mastered their crafts. This campaign gathered the beginnings of some fantastic coverage in relevant trade press. Mark, founder of SCRUBD, began his quest to solve the problem of there not being premium all-natural soap blocks crafted specifically for men by sourcing natural ingredients, mixing his own essential oils, hosting scent testing sessions with friends and family, finally leading to the creation of his very own range of handcrafted soaps. Mark and the SCRUBD team are proud of their British and artisanal methods, and therefore began a quest to champion their own tribe of artisans; a group of ‘Masters’ that are tackling their days in their own unique ways. Thus, the ‘Masters Series’ was born. The full Masters Series films can be viewed here. French baby skincare brand Mustela have had a brilliant month, trending as one of the top SPFs in mothering titles including Absolutely Mama magazine, Mother & Baby and My Baba. The launch of the maternity range has been a big focus, making waves within trade and digital titles. They have some exciting partnerships in the pipeline to look out for. The brilliant Endosphères Therapy, using microvibration technology, has been tipped to be one of the most innovative machines for combating stretch marks and cellulite for 2018. They featured in Cosmopolitan and the Telegraph Online this month, as well as with bloggers and influencers including Eat Wear Travel and Taislany Gomes. Towards the end of May the Social Media team visited another great Kruger Cowne Breakfast Club meeting. This time the talents of Founder of Vibe Tickets and Tech Entrepreneur, Luke Massie (26 years old) spoke, alongside Teenage Tech Entrepreneur and Ambassador to The Princes Trust, Ben Towers (19 years old). Youth certainly does have a part to play in the success of these two and talks from both made for a very inspirational morning.